Great Northern Yarn Haul – Love.Yarn.Shop. The third Great Northern Yarn Haul was held from Friday, July 13th to Sunday, July 29th. The rules last year made you eligible for prizes with just 10 shops visited. A piece of cake! We’ll were joined by Good Karma Farm, Two Sisters Mill & Mercantile, Northeast Fiber Arts, and Vermont Yarn Shop. There were only 20 bags being issued per shop, so people had to sign up in advance. We can’t wait for next year! The second Great Northern Yarn Haul was held from Friday, July 7th, to Sunday, July 23rd and included 23 shops from New Hampshire, Vermont, and Maine. Fiber enthusiasts joined at their local yarn shop with a $20 purchase, starting July 7th. At Love.Yarn.Shop. we had a kick-off on Friday, July 7th at 5:00 with door prizes, nibbles, and sips, and great company. Nancy Lyndes won the grand prize from L.Y.S. The big surprise, though, was that Stephanie Brooks, who won last year, won again this year. Check out the picture below when Vivian from Grand View Lodge and Paula from Love.Yarn.Shop discovered this! Here’s a list of the shops and their hours, phone numbers, and addresses who participated in 2017 and we hope more will be joining us is 2018. Lamb’s Ear Yarns, 3 Waterford Place, Gilford, NH 03249 603-528-4333 11-5 Tue, Wed, Thurs. Fri 11-3 Sat. The first Great Northern Yarn Haul was held from July 8-17, 2016 and included 16 yarn shops across Vermont, New Hampshire, and Maine. Participants went to their local yarn shop and with a purchase of $20 or more received a brochure with their “passport” and a tote bag. Each store they visited had a goody bag with discount coupons and “give aways.” The passports were mailed in by July 31st and a winner (Stephanie Brooks from Wallingford, VT) was chosen who received a box with gifts from each of the participating stores. Paula Herbert from Love.Yarn.Shop. 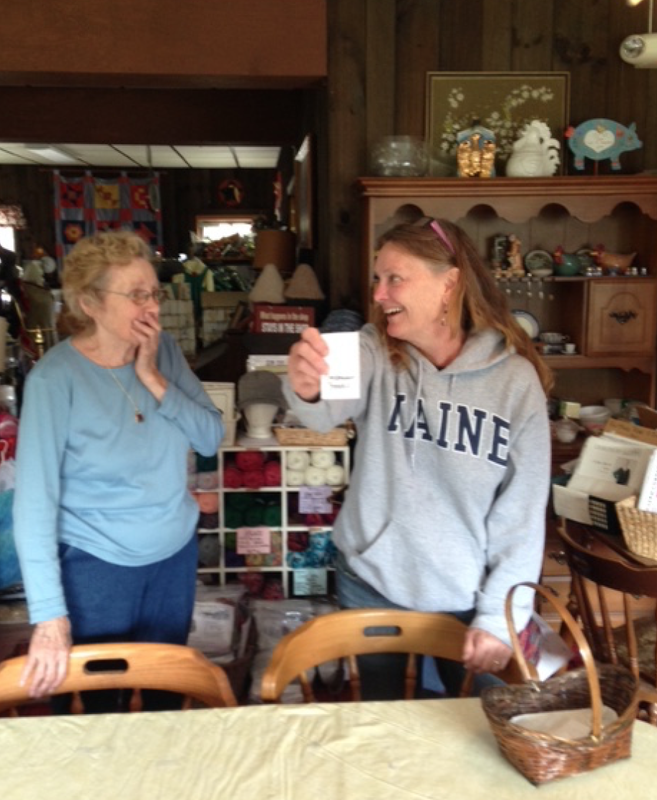 with Nancy Stellakis from Nancy’s Alterations and Yarn Shop in North Conway choosing the winning ticket. I missed this year’s but want to plan ahead for next year! Do you know about when this will be in 2018? In July again, probably for most of the month!